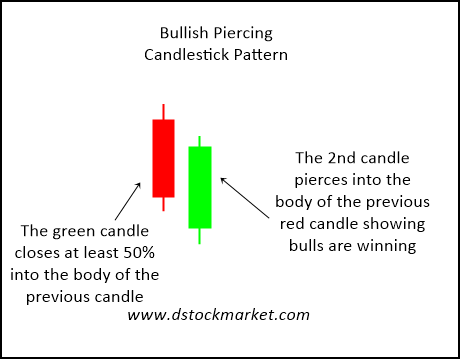 The bullish piercing candle pattern is a bullish reversal candlestick pattern that often appear at the end of a downtrend or correction. This pattern appears quite often in stocks and traders can take trades based on just the candle pattern. If this candle pattern appears at price support or important moving averages such as the 50 MA or the 200 MA, it can be a very powerful reversal signal. The picture above shows the construction of this pattern. There will be a bearish candle followed by a candle that gaps open lower but closes at least 50% into the body of the previous candle. The bullish candle does not close above the highs of the previous red bar. Otherwise it will be called a bullish engulfing pattern instead of a bullish piercing pattern. It is important to note the psychology behind this pattern. As the stock moves downward, the bearish sentiment is extremely strong. Then the stock gaps down and this immediately bring in more bears. However, by the end of the day, the stock not only recover from the gap down, it actually closed higher well into the body of the previous red bar. This tells us a strong picture that the bears were not in control and the bulls are starting to come into the picture. The chart above shows DISCK having a correction from mid December to January. 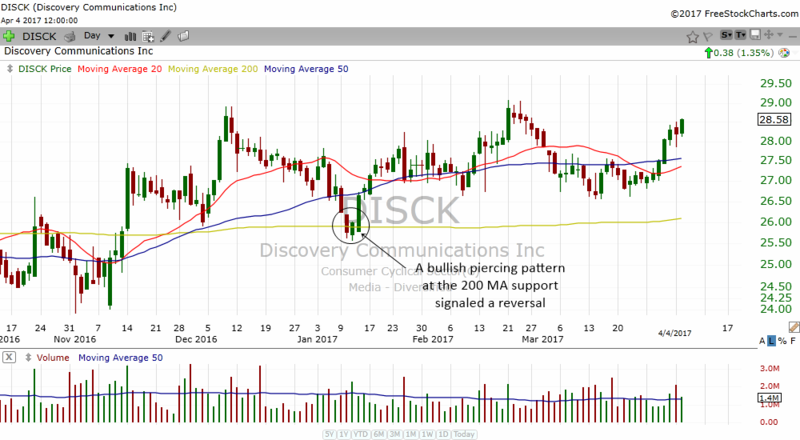 As the stock fell and reach the 200 MA support, it formed a bullish piercing pattern. When you see this pattern happen at the 200 MA, pay attention. The stock may be trying to tell you that it is bottoming. True enough, the stock halted the downfall and rose for a week or two. Combining candlestick patterns with other technical analysis is indeed a very powerful and potent signal for trading. 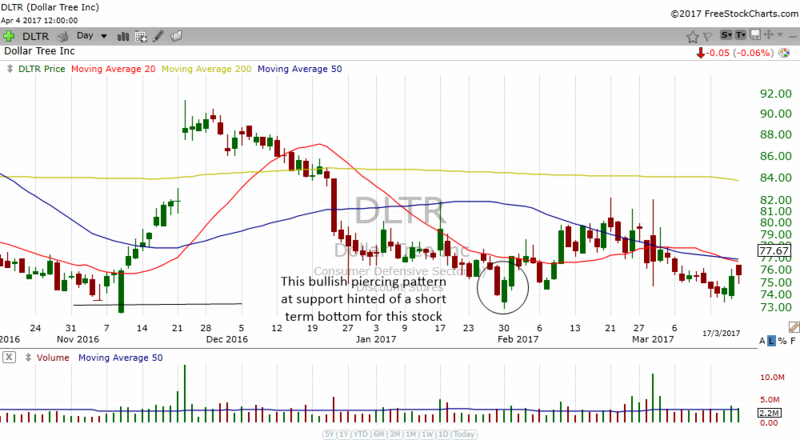 The stock chart of DLTR above shows another example of how the bullish piercing pattern can tell us of a short term bottom. The stock was actually trying to breakdown but the breakdown failed and a bullish piercing pattern formed at support. This immediately told traders that the breakdown will not follow through and a short term bottom in the stock formed. Estee Lauder was trying to form a bottom in its daily stock chart. As it tried to make a new uptrend, the stock formed an uptrendline and it corrected to the uptrendline support. 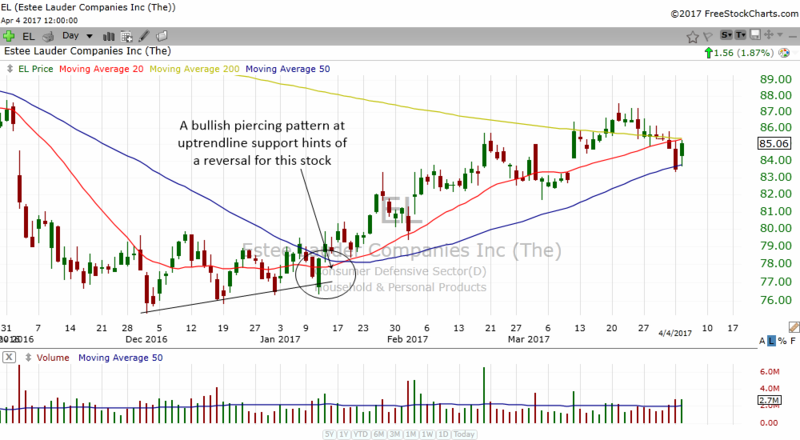 A bullish piercing pattern formed at the trendline support and this hinted to traders that this stock has successfully bottomed. Look how the stock rose and started a nice new uptrend. 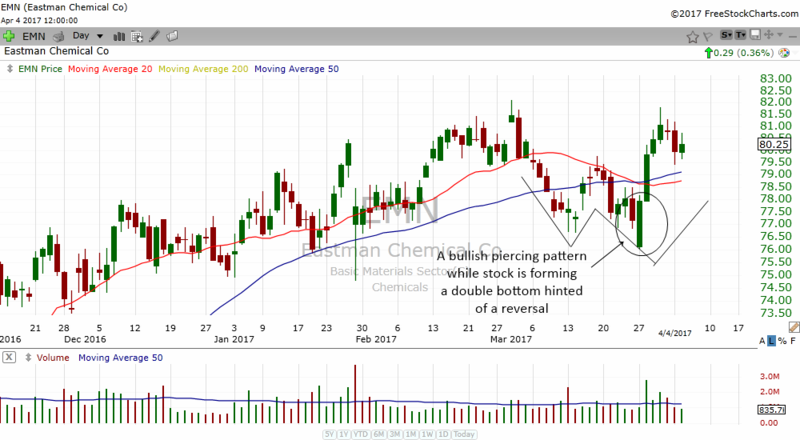 Finally, when you see a stock forming a bullish piercing pattern while it is also forming a chart pattern, take note. EMN was in the process of forming a double bottom. A bullish piercing pattern appeared at the second bottom and this gave a powerful hint that this stock is forming a short term bottom. Some traders do take a trade when these kind of patterns form. So the next time a bullish piercing candlestick pattern appears alongside a chart pattern, always be ready to hit the buy button for a short term trade.